Stuart Crisp, Business Development Director for the British Precast Drainage Association highlights one area where overspecification can lead to unnecessary cost and points to evidence from one enlightened specifier. The choice of bedding design and standard of construction is as critical to the success of a pipeline installation as the choice of pipe.Understanding its importance, but not understanding the choices available, can lead to overspecification. When a drainage pipeline is buried in the ground, loads are transferred between the pipe and the surrounding earth by the bedding surrounding the pipe. There are three main types of load that apply: the weight of the overlying trench-fill, pressures transmitted to the pipe from surface loads such as traffic, and the supporting reaction from the ground beneath the pipe.In addition, for larger diameter pipes the load imposed by the water in the pipe may also need to be considered. There are a range of bedding solutions – or Classes - that are acceptable depending upon the material from which the drainage pipe has been manufactured, its strength and performance characteristics, traffic loading and the depth at which it is installed. The options are described in British Standard 9295: Guide to the Structural Design of Buried Pipelines. The most significant differences between bedding Classes is the extent of the area around the pipe where granular bedding material is placed. Class S bedding, for example, requires a pipe to be completely surrounded by granular material. Other classes, such as B, F and N require significantly less material. BS 9295 provides examples of common pipe materials and their structural classification.Concrete, clay and reinforced concrete have a structural classification of ‘rigid’, ductile iron and thick-walled steel pipes are termed semi-rigid while thermoplastics, glass reinforced plastic and thin-walled steel are all termed ‘flexible’. Bedding is particularly important for flexible pipes, such as sewer pipes manufactured from HDPE. This is because pipelines constructed with flexible pipes need to derive a significant proportion of their structural strength from the embedment either side of the pipeline to prevent them deflecting excessively under load, a condition known as ovalisation, where initially the vertical diameter of the pipe reduces and the horizontal diameter increases.Ovalisation is undesirable.When ovalisation occurs, the structural capacity and hydraulic capacity of the pipeline is compromised.In extreme cases, progressive ovalisation can lead to buckle failure and collapse of the pipe. As a consequence of their lack of inherent strength, flexible pipe installations depend heavily on a high quality installation where the construction is carried out precisely to the engineer’s specification where the surrounding embedment takes the majority of the pipeline’s designed loading.The specifier may find that their options for bedding design are limited and the installation is more likely to need Class S full surround bedding, the most expensive in terms of both financial cost and carbon cost. The use of Class S full granular bedding will impact on material cost and vehicle movements. Considerable quantities of aggregate will need to be transported on to the site.In the opposite direction, the soil removed from the trench will often need to be sent to landfill if it can not be appropriately disposed on site.All of this adds to cost as well as making a significant contribution to the environmental impact of the project as a whole. All too often we see specifiers tending towards a default Class S specification without knowing, understanding or considering the other options available when using different combinations of pipe material and bedding design. 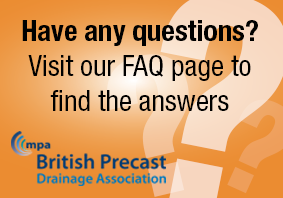 To help make the options more transparent, British Precast Drainage Association has developed a web-based Structural Design Calculator tool to help with the selection of appropriate bedding Classes for buried pipelines and a second tool – the Material Cost Calculator – to enable a clear cost comparison of different solutions. Using these calculators allowed Leeds based ground worker and civil engineer Athena Civil Engineering to take the initiative on a new housing development in Roundhay near Leeds, to reduce the amount of primary aggregate used on the drainage works. 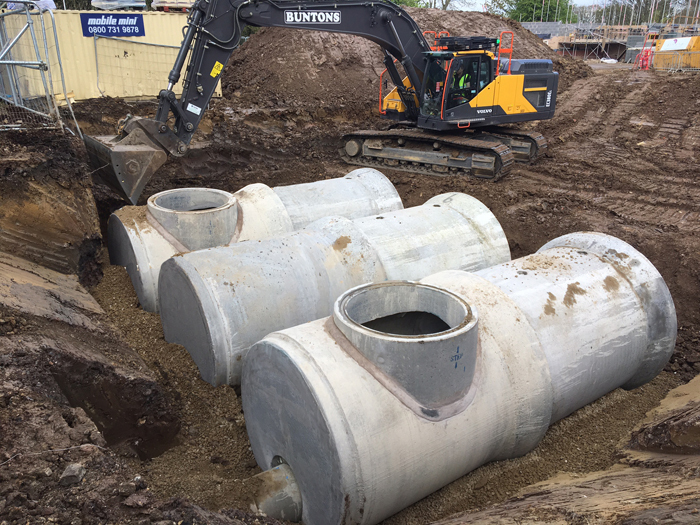 Their design took into account the understanding that using a full Class S granular bedding in conjunction with large diameter precast concrete pipes is often overspecifying the buried pipeline design. Working on behalf of housing developer Chartford Homes at their new Hampton Park site, Athena constructed a storm attenuation tank using British Precast Drainage Association member FP McCann’s large diameter reinforced concrete spigot and socket pipes.By adopting a Class B embedment design, Athena has achieved significant cost savings and minimised environmental impact on site without sacrificing installed performance of the completed system. The attenuation tank set out in four pipe runs consists of 12 standard DN1800 2.5 metre spigot and socket pipes, 4 DN1800 pipes with end caps and 4 DN1800 pipes with end caps and cast in side entry access. Using the British Precast Drainage Association Structural Design and Material Cost calculators, Athena was able to determine the optimum bedding design to adopt for the project and calculate the cost benefits versus a plastic system with a full Class ‘S’ granular surround.Key inputs into the model included pipe sizes and comparative costs together with imported granular material prices.Consideration was also given to the trench excavated material which was deemed suitable for final backfill purposes. With cost under ever more scrutiny on every project, we believe that many engineering firms are, like Athena, open to suggestions of how changes at the design stage can impact on the cost, efficiency and environmental impact of pipeline installations. Bedding design is one area where it is possible to prove the extent of this impact and the British Precast Drainage Association Structural Design and Material Cost calculators can play an important role. The British Precast Drainage Association Structural Design Calculator can be accessed via www.precastdrainage.co.uk/page/structural-design with the Material Cost Calculator available at www.precastdrainage.co.uk/calculators/material-cost.